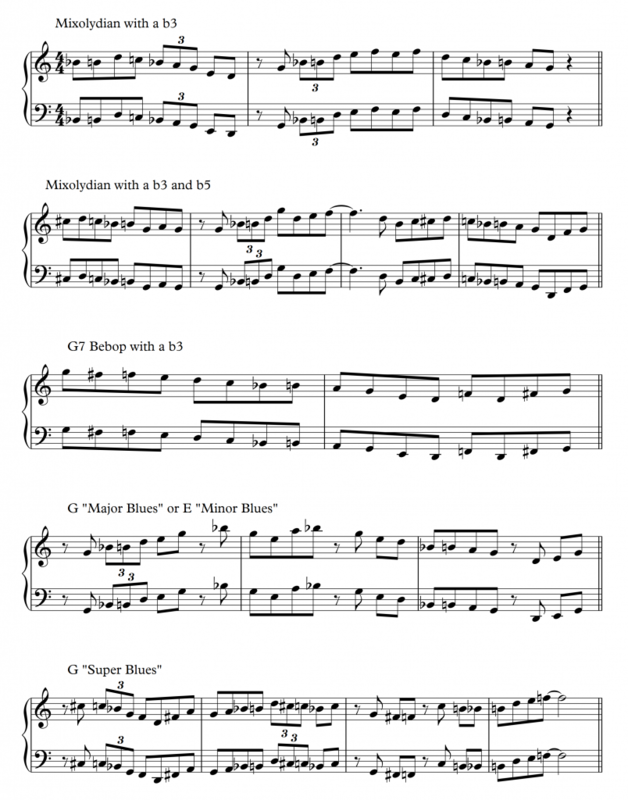 The blues scale is a very useful scale, but I’ve found it doesn’t always adequately capture what jazz musicians actually play when improvising over a blues in a “bluesy” way. I distinguish the “bluesy” moments of jazz solos from the “jazz” moments in the same solos. For me, a “jazz” idea is one based on the musical vocabulary of the swing, bebop, and later eras. Jazz vocabulary from these eras often extends beyond mere pentatonic and blues scales and includes diatonic (or “church” modes) as well as chromaticism and other non-diatonic ideas. However, the blues is a vital aspect of and influence on jazz, and so jazz musicians often also use blues vocabulary, which is primarily based on blues scales and pentatonic scales. 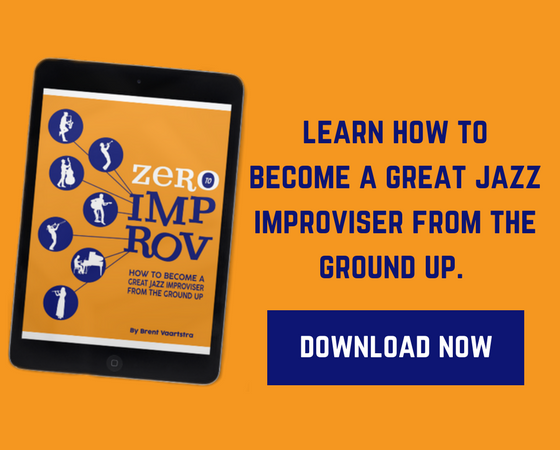 But many jazz musicians also blend jazz, classical, and blues vocabulary while soloing – sometimes even in the same phrase. So I want to offer up two made-up scales I’m going to call “super blues scales” or “alternate blues scales” as useful tools to help you access blues vocabulary in a jazz context. As always, take this with a grain of salt. 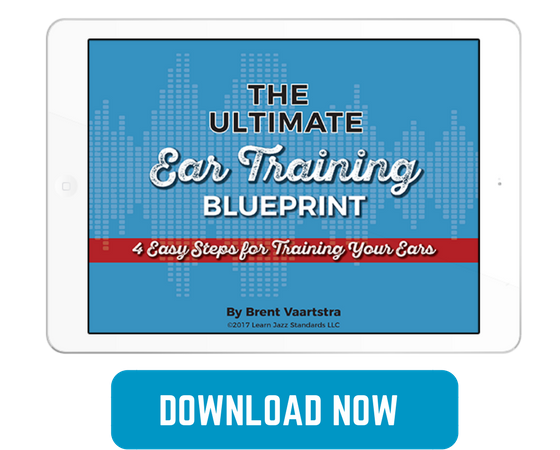 Theory always comes after practice, not before, and nothing can substitute for the immense value that comes from listening to great jazz and blues recordings and trying to absorb these styles’ vocabularies organically by ear. It is especially important to point out here that the elements that make blues music (and bluesy melodic ideas in a jazz context) so compelling involve much more than mere note choice. In order to play the blues effectively (in any context), you have to absorb the subtleties of timbre, pitch bending, rhythm, time-feel, space, motivic development, call-and-response, and emotional expressivity that make the music so special, unique, and moving. But that being said, having theoretical tools to supplement your aural instincts can be helpful. It’s best not to think of these scales as the only scales, or even the “best” scales to use when improvising over blues, but rather think of them as just another couple of tools in your musical toolkit that can help you generate melodic ideas when improvising in a blues context. A blues context for me means anytime a bluesy melodic idea is appropriate, so feel free to use these scales in other situations in addition to improvising over a blues form. The idea behind these scales is to have one single scale that should work over the whole form of a blues. They should also work over any dominant 7th chord that shares the same root as the scale (assuming bluesy vocabulary is appropriate over the dominant 7th chord in question). 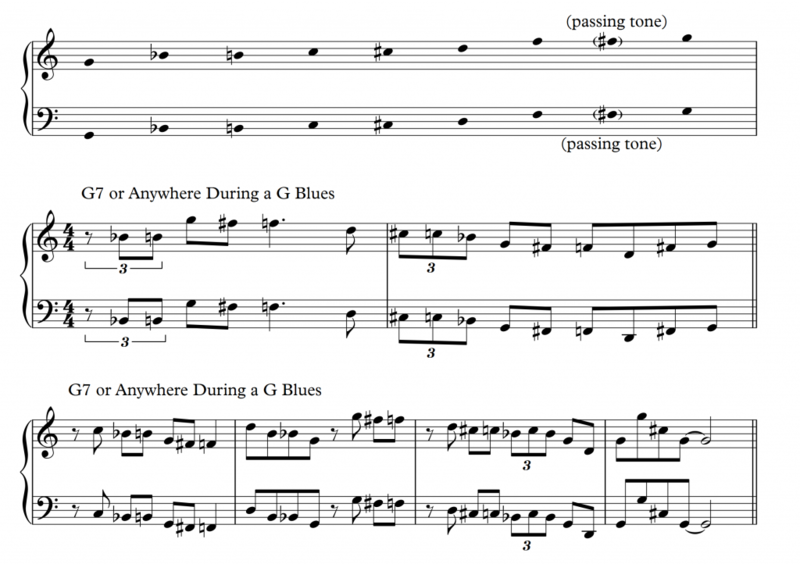 This scale combines some elements of blues and bebop vocabulary. It’s basically a blues scale with the major third added back in because a lot of jazz and blues incorporates the ambiguous mixture of minor and major thirds (and bent thirds that are not clearly major or minor). The scale also adds back in a major 7th as a passing tone to give it a slight bebop tinge (although even early New Orleans style traditional jazz vocabulary occasionally includes the major 7th as a passing tone on dominant 7th chords – for just two examples, see “Jelly Roll” Morton’s “Shreveport Stomp” and “Tom Cat Blues”). It’s very important to note that the major 7th is a very special note in the context of this scale and should only ever really function as a passing tone. All other notes in the scale can be emphasized, but the major 7th really only works in this scale as a chromatic passing tone between the root and b7. There are a few variations of this “flavor” of scale, but the general idea is, again, to introduce that major/minor third ambiguity to give the scales a bluesy tinge. So this scale and its variants are all based around taking a diatonic Mixolydian scale and adding the b3 in, with other notes omitted and/or other blue notes added (taken from the blues scale). Version II-4: What I call the “major blues” scale, which is a major pentatonic + a b3. Or you can think of it as the “minor blues” scale – the typical blues scale – played from the relative minor. Enjoy playing around with these as a way to conceptualize the blues sound in a new way. These options will expand upon the traditional blues scale and help open up your note choices even more. Happy practicing! Glad you enjoyed it Mike! Much thanks to Josiah, one of our writers, for delivering. I am reentering music after a 35 year hiatus, gotta keep up with the grandkids , I have 7 and between tbem play 5 instruments, family swing band forming. Nice Kevin! Thanks for being a reader.